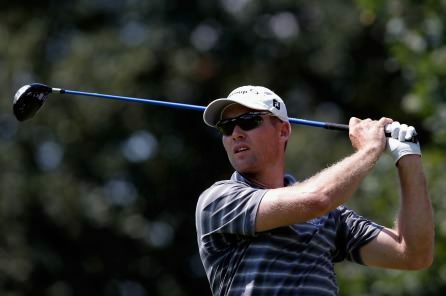 Trevor Fisher Jnr posted a nine under par 63 to take a two-shot lead over Matt Ford into the final round of the Africa Open at East London Golf Club. With South Africans winning this event on all five previous stagings, 35-year old Fisher could continue that trend on Sunday as he stormed into the lead on 16 under par. He made an eagle at the third as well as seven birdies, with five of those coming in his last eight holes, in an error free to take control in tough, blustery conditions. "I played solid, but didn’t expect a 63 in such tough conditions," he said, before looking forward to the final round. "I’ll play my own game and take it shot for shot. I’ll try not to get ahead of myself too much, because that is the challenge in itself when you’re leading an event. I’ll put my head down and try tomorrow." It was a mixed day for the Irish with Darren Clarke shooting 72 and Damien McGrane a two under 70 to share 41st on four under. Kevin Phelan, who led after the first round, shot a 74 to fall 39 places to tied 53rd on three under. The Waterford Castle man bogeyed three of his first 11 holes before clawing back a shot at the 16th. Overnight leader Ford had six birdes in a 69 but a double bogey six at the eighth and a bogey at the 14th left him second on 14 under with Jaco van Zyl (68) two shots further back in third. Damien McGrane played his final nine holes in four under par to make the cut with ease in the Africa Open. Damien McGrane and Darren Clarke proved that it's not how you start but how you finish in the Africa Open at East London Golf Club. If Trevor Fisher Jnr wins the Joburg Open he will prevent Ricard Sterne overtaking Shane Lowry in the world rankings. Picture ©GettyImagesSouth Africans Richard Sterne and Trevor Fisher Junior will enter the final round of the Joburg Open with a five shot lead over the rest of the field after a titanic battle for supremacy on day three at Royal Johannesburg & Kensington GC, writes the European Tour.